watch.de - Our specialised shop for watches and jewellery is the leading retail business of its kind in Europe. Starting out in 1976, we have always been a competent partner for all of our customers. As an Internet pioneer, we established our online shop www.watch.de in 1994, offering luxury new and used brand name watches of all renowned manufacturers. 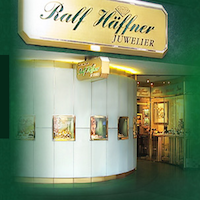 Our companies Rent-a-Juwelier and Häffners Pawn Shop allow us to be supplied with a worldwide unique and comprehensive product, and service portfolio that leaves no wishes unfulfilled. Our parent house, Juwelier Ralf Häffner, is located at Eberhardstrasse 4, directly across Kaufhaus Breuninger in the heart of Stuttgart.